It may be Winter outside but I am dreaming of Spring, warm weather and easy layers of clothes. With these being said, I couldn't wait anymore and a few days ago I wore this beautiful navy Floral dress from Review Australia Spring Collection together with this classic navy (on the outside ) and so fun on the inside (the linen) trench coat. Perfect for Valentine's Day! The pink (the color of this Holiday) is very subtle but the whole look is totally feminine and classic and if I may: pregnancy approved :) These two together look like a set but they aren't. They come separately. Find this dress Here and the trench coat Here. 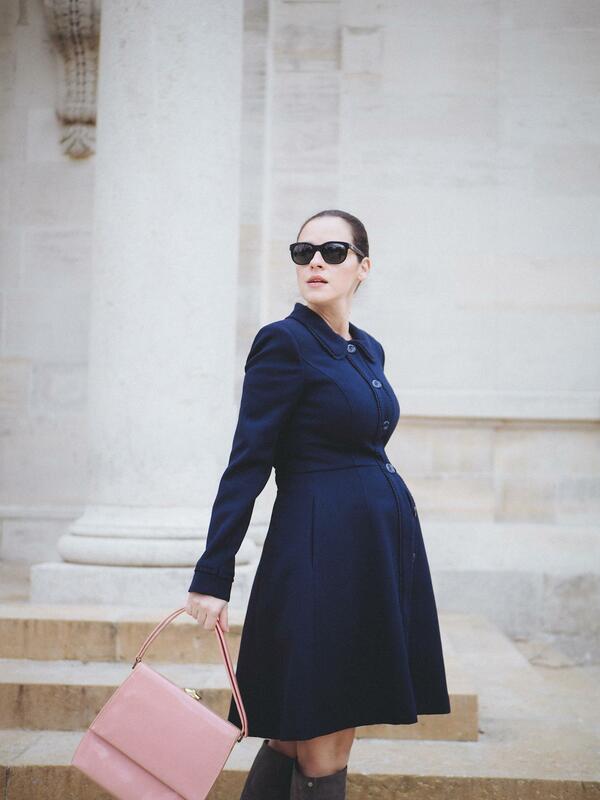 At this stage of my pregnancy, I mostly wear "stretchy" garments, especially sweater dresses but I had a wonderful surprise to notice that a dress like this fits me well and from time to time I can still wear classic and ladylike dresses. As I said Winter is still here so boots were definitely the right option for this look but I can definitely see it with pointy pumps as well. (For a date on Valentine's Day try suede red pumps if the weather allows you). Discover Review Australia New Spring Collection and indulge some self-gifting. So many wonderful options and if you are like me and love vintage-inspired dresses, floral prints and pastel colors, this collection is speaking your language. You may find your Valentine's Day look right there. I saw a couple of adorable pieces, and the "CHECK ME OUT DRESS" and the dress that I am wearing in today's post: " FORBIDDEN CITY DRESS are my most favorite and definitely a must-have. Let me know what catches your attention! I love your both coats, they suit you and your style perfectly! Such a classic look! Love the navy and pink together.